The American media is still fixated on every nuance of the aftermath of the US midterm elections. They will soon be fixated on the lame-duck session of the current Congress in December, after which they will be fixated on the new US Congress in January, etc. In other words, the US media is still ignoring very important events and developments around the world. The Mideast, the Brexit-EU situation, and deteriorating US-Chinese relations could have major impacts on the world you and I live in. This post will focus on the latest war drums being sounded in the South China Sea. As readers, no doubt realize, China has been attempting to assert sovereignty over the South China Sea, a large body of water that has long been an international waterway. As many as six nations claim control over some portion of that sea. China, however, has built artificial islands in the South China Sea and is militarizing them. China seems poised to seize open control over this vital maritime region through which a large percentage of global maritime shipping flows. Almost the entire remainder of the world does not recognize China’s claims and wants on-going international shipping rights to prevail in these waters. China’s apparent intention and the desires of the rest of the world are not compatible. An armed clash is likely, if not inevitable if China does not back down. The USA leads the nations that want the South China Sea to remain an international maritime zone. This is not the only bone of contention. China regards Taiwan as a renegade province, and the USA regards it as a nation entitled to self-determination. The USA and China are starting to hurl ultimatums at each other, and this kind of action has often been a prelude to war in past history. 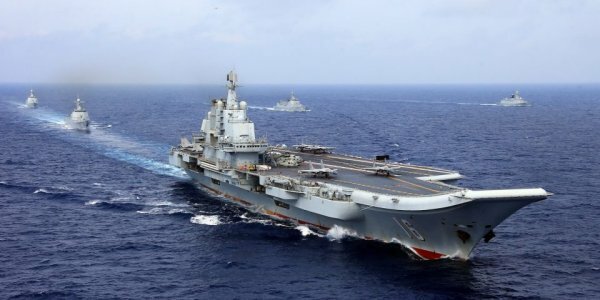 The first link headlines its story by saying “The US tells China to remove missile systems in the South China Sea (emphasis added).” The article reviews China’s militarization of the disputed islands and adds that the “US and its allies have been told by President Xi…to stop sending ships and aircraft near what [China] considers being sovereign territory (emphasis added).” Notice the imperative tense that is being used by both parties. These statements sound like mutually-exclusive ultimatums. US Vice President Mike Pence flew to Singapore recently and made it a point to have his plane fly close to the disputed islands in the South China Sea as part of an ongoing “freedom of navigation” operation by the USA in those waters. The article in the second link leads its story with an observation that “the US appears to be girding for a fight.” It also reminds readers that China’s President Xi told US President Obama in 2015 that “Beijing would not militarize its then newly-built islands in the South China Sea.” As the entire world now knows, China lied. It has been doing exactly what it said it would not do, but President Obama did nothing throughout his term of office about it. Obama’s pacifism surely emboldened China to pursue a very aggressive policy in the region, but President Trump has adopted a muscular policy in place to ensure that this maritime zone remains international waters. Things could spin out of control quickly if an incident on sea or in the air results in a combat situation. The third link reports about an incident where China warned a US warship to stay out of the South China Sea. On a recent state visit by the Malaysian president to New Zealand, the Malaysian leader spoke so openly about the dangers of the situation in the South China Sea that New Zealand’s leader had the press removed from the room so they would not hear the kind of blunt conversation that is usually spoken in private between national leaders (fourth link). US Vice-President Pence also warned about a new “Cold War” if China doesn’t make trade concessions (fifth link). The Taiwan Strait is a relatively narrow body of water that separates China and Taiwan. After China conducted a naval exercise in that region, the US Navy responded by sending a cruiser and destroyer through the same region. The final link offers a video of the US warships transiting the Taiwan Strait, accompanied by two vessels I assume to be Taiwanese warships. The statements and actions of the leaders of the USA and China are beginning to look ever-more like a game of “chicken” where two opponents head straight at each other, seeing if the other will “blink.” I don’t see either party “blinking” yet. The escalation of rhetoric to the point that China and the USA are telling each other what to do is very close to adding an “or else” to the demands made on each other. This kind of language has often lead to a war in world history. This situation needs to be watched very closely. Over the years, I have opined in my posts that China may actually desire a regional war in the South China Sea and that it is engaging in very provocative behavior to start such a war. China has built an array of new weaponry on land, sea, and air, but it has never tested any of its new weapons in actual combat conditions. China may want a regional war to see how well its new weapons perform vs. US warships and warplanes. China would have the advantage of fighting such a war close to its own homeland, but the USA has a variety of allies in the region. China is open about wanting to be the new global superpower, and it has built ballistic and cruise missiles and torpedoes to sink US aircraft carriers. If China’s weaponry fails against US weaponry, China can retreat as gracefully as possible. However, if China succeeds in sinking a US carrier, it may get a much more costly war than it desires. President Trump has characterized himself as a “counter puncher,” meaning he will hit back just as hard as an opponent attacks him. If a US carrier is sunk by China, I expect Trump to exact a very heavy cost from China. In past posts, I have suggested that an American response to the sinking of a US carrier could be the USA raining ballistic missiles, bombs and cruise missiles on China’s Three Gorges Dam until it bursts. This would send a huge fresh-water tsunami all the way through much of Southeast China, doing far more damage to China than China could do to the USA by sinking a carrier. If China attacks US warships, the American military will surely sink all the Chinese ships that it can so long as such a regional war lasted. Logic argues strongly that such a war should be avoided and that the South China Sea needs to remain an international maritime zone for the shipping fleets of all nations. However, wars begin when logic fails to carry the day. As long-time readers of my blog know, I view modern geopolitics through the prism of biblical prophecy. The Bible has many prophecies that foretell what will come to pass when the end of our age is reached in a climactic time called “the latter days” or “time of the end.” These prophecies include such specific predictions as (A) that the Jews will again have a homeland in the old Promised Land which will include the coastal Mediterranean region and the city of Ashkelon, (B) that there will be an explosive “knowledge explosion,” (C) that mankind will develop technologies that can end human life on earth and (D) that advanced latter-day technology will be able to collapse a global economy within “one hour.” All these specific prophecies have come to pass…literally. Given such accurate prophecies in the bible about our time, one would have to be a fool to ignore the remainder of Bible Prophecy which pertains to the time just ahead of us. For documentation of these claims, please read my free articles, Are We Living in the Biblical Latter Days?, Four Reasons the Jews are Judah and What Ezekiel 38-39 Reveals about a Future World War III.